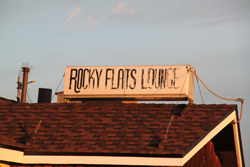 If Colorado and Wisconsin had a one-night stand, the Rocky Flats Lounge would be their love child. 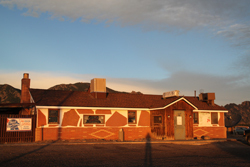 This roadhouse has been a stalwart at the foot of the Flatirons, halfway between Golden and Boulder, since 1978. Once the payroll office for the Rocky Flats nuclear weapons plant, the building was purchased and transformed into a watering hole serving plant workers at the end of the workday. Its original owner was a Wisconsin native, and drew in the Packer faithful with walleye, perch, and green-and-gold memorabilia. Today, the bar has retained its gritty authenticity, offering live music occasionally and Friday-night fish-fries religiously. The nuclear weapons are long gone, but at the Rocky Flats Lounge you can still get more bang for your buck. This t shirt was perfect for my dad's dark sense of humor as a Rocky Flats Downwinder. The shirt itself is some of what must be the now defunct American Apparel's last stock, which is lucky for anyone who buys one. These shirts seriously hold up from my experience. The customer service from Loyal Tees was also top-notch, exceptional company. Good work! Made in America and Tested in Japan Baby! This shirt is the bomb! Seriously, nuclear wasted right out side of a plutonium facility is ironic right?